My first ultra distance! Sometime ago, my friend Richard asked if I’d like to run an ultra with him. My response was not dissimilar to “Heavens man, what are you thinking? Good Lord no.” Actually it was quite dissimilar to that, but you get the idea. However, as time passed over the summer I mellowed a little and even began to warm to the idea. And so it was that on September 7th 2014 I found myself on the start line of the Longman Ultra at Devil’s Dyke near Brighton, East Sussex. 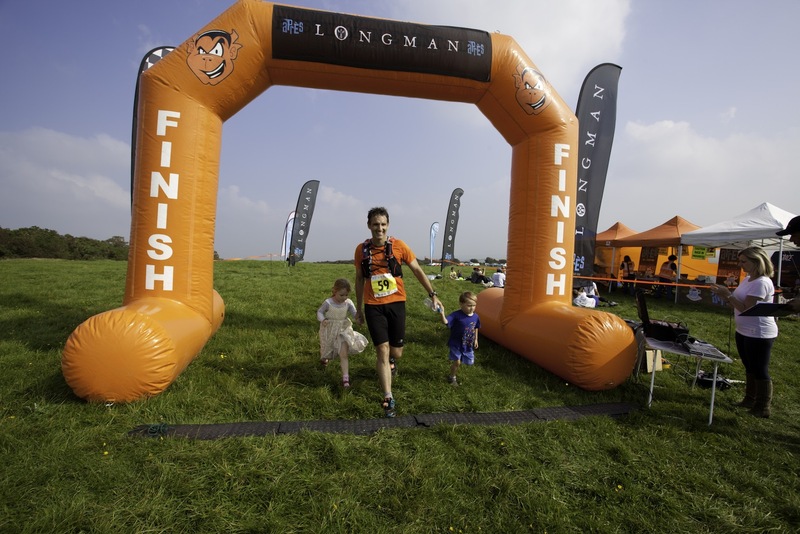 The Longman Ultra is a 33 mile, 54km gentle introduction to the ultra distance. It was an absolutely glorious day when I arrived at a field a few hundred metres from Devils Dyke, with some 40 other ultra runners and some who were doing a 10 mile jaunt….slackers. Having never run 33 miles before, I had a plan to walk up all of the hills regardless, to conserve energy. Richard had decided he would actually try and race the thing. But he is a bit wrong in the head. So at the gun he sped off like a loon, whilst I trotted gently along at 11 minutes per mile. I was wearing my Salomon S-Lab Hydro 5 hydration backpack race vest thingy and it was packed with various chewy bars. I had also put a couple of Nunn hydration tablets in my hydration bladder, which I came to regret later. 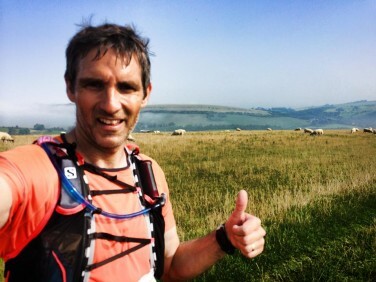 The longman Ultra route could not have been nicer. From Devil’s Dyke we headed west towards Upper Beeding for a couple of miles before turning back and dropping in to Devil’s Dyke itself. During the early part of the run our view was temporarily obscured by an eerie blanket of mist. There was a really long climb back out of the dyke which of course I walked. When we got to the top and turned east to follow the South Downs Way, the 10 mile runners were heading towards us back to the finish. Over the A23, up past Pyecombe Golf Club and on to the first aid station at the Beacon Road crossing. I was taking it nice and easy. For some reason, even though I had my hydration pack with me, I decided to take a bottle of water at the aid station. It was annoying because I then had to carry it because there were no bins in which to throw it and I am a responsible citizen of the countryside! It was somewhere along this section of the run that I began running with Mark Johnson. He told me this was his 99th marathon. The 100th would be the Farnham Pilgrim Marathon, which I am also running. We ran together until the aid station at 16 miles. The aid station at Housedean Farm was really well stocked with all sorts of goodies from Rice Krispie cakes to crisps and flat Coke. I took a little breather here before continuing over the A27 road via the bridge and again following the South Downs Way up the hill. At this point we started to see the lead runners coming back in the other direction. Turns out Richard was in 6th place and running very well. I continued to run with Mark until just before the turn. The turn point was over half way because of our little jaunt west at the start of the run. So when I turned to head home at the top of a hill not far from the village of Kingston I had something like a half marathon left to run. Back down at Housedean Farm for the second time I stopped to use the facilities and splashed loads of cold water over my face and even had a quick wash with soap and everything. I felt a lot fresher after that! Immediately upon leaving the aid station was a steep hill. So I took the opportunity to phone my wife as I was walking up it. At this point I had some 10 miles left, which didn’t seem like a lot. It was a really warm summers day and my stomach wasn’t feeling great by now. I wasn’t enjoying the taste of the Nunn hydration in my bladder and was beginning to wish I had simply filled it with water. I topped up with plain water at the aid station 6 miles from home. Later my new friend Mark informed me that he had stopped at the same aid station a little while later and bought ice cream. I wished I’d done that!! I found the final 6 miles very tough indeed. Funny, I thought, that when running a marathon we get to 20 miles, 6 miles from the finish and we hit the wall. Now here I am running the 33 mile Longman Ultra. I feel ok up to 27 miles and then I hot the wall. Makes me think it’s hugely psychological this wall thing. Anyway, just as I thought I was nearing home I arrived at the foot of a hill. I decided, as I had done with all the hills, to walk up it. The problem was that it was a really, really long hill and took me ages to get up. I must have walked two miles and cost myself a good 20 or 30 minutes. I eventually reached the top and it was just a short run to the finish. Unfortunately my stomach was not happy at all by this point and I struggled to put one foot in front of the other. However, I was spurred on by seeing a couple of runners gaining on me. I determined that I would not be overtaken in the final few hundred metres and managed to run all the way back. I ran across the line with my two youngest children, Elsa and Ellis in 6 hours 20 minutes and in 18th place out of 40. Richard had finished an hour ahead of me in 6th place and had already left by the time I got in. The final mistake I made was to eat the free pasta that was on offer after the race. It was simply too much for my delicate stomach and I subsequently spent 5 minutes crouched by a classic car behind the race control tent, throwing up. Not my finest moment! Mark crossed the line 30 minutes later in 27th place in his 99th marathon. I thoroughly enjoyed my first ever ultra distance, despite the stomach issues. Having started the year laughing at Richard’s suggestion, I have now completed one ultra and I am signed up to do the Brecon Beacons 46 mile ultra in November. It gets in the blood this distance running malarkey. Now, I just need to understand race nutrition and hydration a little better. Then I can concentrate on reaching 100 marathons like my new friend Mark is about to do. All in all I have to congratulate the Longman Ultra organisers on a well managed event. The aid stations in particular were very well stocked. The medal and t-shirt are also stylish and very good quality. I do like a bit of race bling! The weather could not have been better and the route….well it’s hard to beat the South Downs for picturesque English countryside. Certainly it gives the Lake District and the Jurassic Coast in Dorset a run for their money (if you’ll pardon the trail running pun). 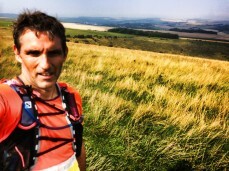 If you have enjoyed reading my Longman Ultra race report, please share it and click that old like button. Do please also head over to my YouTube and Vimeo pages to watch my race films.